HUNGARY isn't known today as one of the world's top gold-producing countries, writes Frank Holmes at US Global Investors. There was a time, though, when it accounted for around three-quarters of Europe's entire output of the yellow metal, if you can believe it. According to historian Peter Sugar's A History of Hungary, the central European country was a "veritable El Dorado" in the 14th century, and its gold pieces circulated widely across the entire continent, competing with those minted in Italy and England. It was this rich mining heritage that Hungary's central bank evoked when it announced this month its decision to increase gold holdings tenfold, from 3.1 tonnes to 31.5 tonnes, taking gold's share of total reserves to 4.4%. Gold accounts for 73.5% of US reserves by comparison, the most of any country. Hungarian central-bank governor Gyorgy Matolcsy described the move as one of "economic and national strategic importance," adding that the extra gold made the country's reserves "safer" and "reduced risk". This is the first time since 1986 that Hungary has increased its gold holdings. The country isn't alone in its mission to diversify. This month we also learned that Poland became the first European Union (EU) member to increase its gold reserves in two decades. The Eastern European country added as much as 9 metric tonnes of hard assets between July and August of this year. Central banks in Russia, Turkey and Kazakhstan have also kept up their gold buying, representing close to 90% of the activity we've seen this year. So why should banks â" or investors, for that matter â" be interested in boosting their gold holdings? One reason is timing. Until recently, gold prices have been relatively affordable, trading at 52-week lows of around $1180 an ounce in mid-August and at the end of September. Central banks' investment was wisely made. From those lows, gold is now up more than 4% on stock volatility. Check out the chart below. I think it's fascinating to see the relationship between dramatic moves in the stock market and people's interest in gold. When stocks sold off a couple of weeks ago, Google searches for "gold price" jumped to their highest in at least a month. This shows, I believe, that people recognize gold as a good store of value when market volatility reemerges. Returning to what Hungarian central bank governor Matolcsy said about risk reduction, a certain amount of gold has been shown to improve a portfolio's Sharpe ratio, according to the World Gold Council's (WGC) most recent Gold Investor. The Sharpe ratio, in case you're unaware, measures a portfolio's risk-adjusted returns relative to its peers, based on standard deviation. The higher the ratio over its peers, the better the risk-adjusted returns. 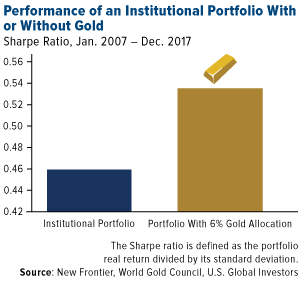 Analysts at New Frontier Advisors found that an institutional portfolio with a 6% weighting in gold had a higher Sharpe ratio than one without any gold exposure. This means that volatility was reduced without hurting returns. Although analysts we re looking at Chinese portfolios in particular, the WGC's Fred Yang believes these findings can just as easily be applied to portfolios that are invested in US-, European- or UK-listed assets. The "research indicates," Yang says, "that most well-balanced portfolios would benefit from a modest allocation to gold." I've often advocated for a 10% Golden Rule â" with 5% in bullion, the other 5% in gold stocks â" and so New Frontier's research is illuminating. It also helps explain Hungary and Poland's actions, as well as those of other net purchasers of gold. I've shown many times in the past that the price of gold is inversely related with real rates. The yellow metal has especially struggled when Treasury yields have outpaced inflation. The two-year Treasury yield, for instance, is just under 3% today, a more-than-10-year high. Because consumer prices are rising at 2.3% year-over-year, according to the latest report from the Labor Department, the two-year has a positive real yield â" and this has historically weighed on gold. You would think, then, that its price would be much lower than it is. I'm impressed with how well it's held up.